1. First of all, can you imagine how many germs these shoes track around? The fabric quickly becomes dirty, dingy, smelly, and matted down. Hello, it's like having mop-heads on your feet. 2. Then there's the fact that these shoes simple look clownish- since when was having large stringy balls of colorful fleece on your feet fashionable? Um, never? 3. Wearing them just screams, "I'm 9 years old, and I'm on my way to a slumber party! Oh-em-gee, let's have a pillow fight!" 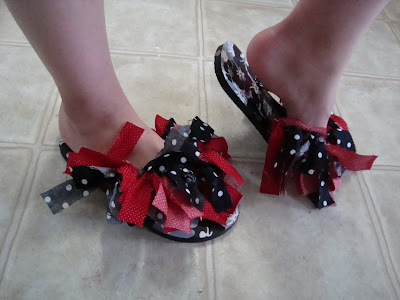 Unless you're a small child these have no place on your feet, especially not in the workplace. 4. If you're resorting to these DIY flip flops as a fun craft project, then please, just stick to the beaded lizard keychains. They're cuter. 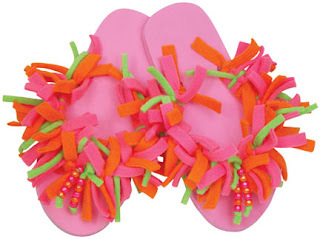 So, if you happen to own a pair of these flip flops, I'd suggest untying the fleece before wearing them out. Or at least just save them for slumber parties.